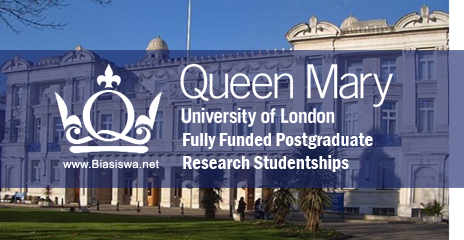 The Queen Mary University of London (QMUL) is inviting applications for 100 fully funded studentships for international students. Scholarships are available for pursuing postgraduate research programme. Scholarship Provider: The Queen Mary University of London (QMUL) is one of the UK's top research universities, ranked fifth for world-leading and internationally excellent research. Level of study: Scholarships are available for pursuing postgraduate research programme. Available Subject: Scholarships are awarded for studying varies subjects offered at the university. Scholarship Benefits: Queen Mary offers research studentships to the value of around �12 million to support PhD students each year. These include our own prestigious QMUL Principal's Postgraduate Research Studentships, as well as Research Council UK (RCUK) funded studentships, funding from industry, and from research charities and cultural institutions. Number of Scholarships: University offers 100 fully or partially funded studentships. Eligible Nationalities: Home, EU, and International students are eligible to apply. University accepts a broad range of overseas qualifications. Consult country/region specific information to find out whether you have the right qualifications. If your first language is not English you must be able to provide recent evidence that your spoken and written command of the English language is adequate for the programmes for which you have applied. For a full list of our English language requirements please see English language requirements web pages. Step 4: Applying to Queen Mary: Postgraduate applications should be made online. Paper applications are no longer accepted.